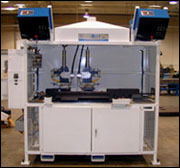 Automation Services - AccuBilt, Inc.
Weld and assembly tooling, power clamping and sensing, error proofing stations and more. 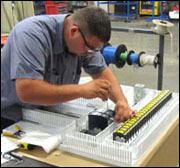 AccuBilt offers refurbishment services on existing AccuBilt equipment as well as equipment built by other automation and robotics companies. Send us your old weld cells and other automated equipment and our skilled engineers can make them better than new with the latest automation technology. 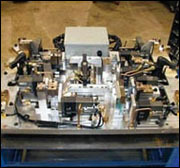 Below is an example of a Lathe Welder we have refurbished, rebuilt and retooled. Our skilled engineers and technicians offer machine rebuild services as well as technical training at AccuBilt's facility or yours. We have our own in-house machining, fabrication, assembly and painting capabilities, as well as the ability to to prototype runs.